Over the years I have noticed that most people are drawn to preaching on end times events. They may want to know if it is the time of Jesus’ return or have a desire to know the future. Some simply are just curious about what the Bible says about this topic. At the same time, I find that most are confused about what happens in the end times because they fail to realize that some of these events are specific to Israel and some are specific to the Church. 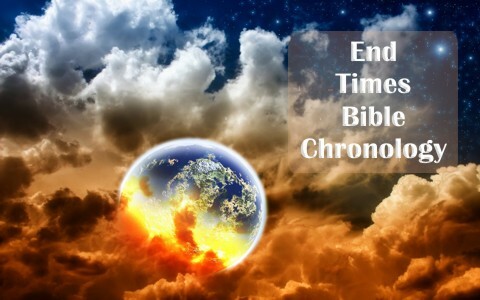 Therefore, a short end times Bible chronology will clear up what is going to happen during the end times. Should we expect a time period called the end times? The Bible has a great amount of references to events that will happen in the future. In Genesis 1:14, we see that God set forth a way to measure time where He uses the heavenly bodies to measure day from night, for signs, for seasons, and for days and years. Some debate what a day is, suggesting that it varies because of what is said in 2 Peter 3:8. However, when you look at the context of 2 Peter 3:8, you find that what was being discussed was people who scoff at end times events because it does not fit into their definition of time. What we also know is that the Hebrew word used for the English word day is the word “yom.” This refers to a period of daylight and a period of darkness in a 24-hour period (Genesis 8:22) (1). Passover. Established by God while the Israelites were in Egypt with sacrificing of Passover lambs. Passover pointed to the death of Jesus on the cross and His shed blood was applied to us so that death would pass over. (Exodus 12; 1 Peter 1:18-23; Revelation 1:5). Unleavened bread. Established by God when He commanded the Israelites to quickly leave Egypt, leaving no time for putting yeast in the bread for rising. Yeast symbolizes sin. The removal of yeast pointed to Jesus when He purged us of our sins and sat down on the right hand of Majesty (Exodus 12:8-20; Exodus 34:18-21; 1 Corinthians 5:6-8; Hebrews 1). First Fruits. First established when the Israelites arrived three days and three nights after Passover on the opposite shore of the Red Sea as the firstfruits out of Egypt. Later observed as first fruits offering of the ripening winter grains on the first day of the week after Passover. This pointed to Jesus’ resurrection as the firstfruits from the dead (Exodus 14:30-31; Exodus 34:26; Leviticus 23:9-15; Numbers 28:26-31; 1 Corinthians 15:12-24). Pentecost. First established when Moses received the law on Mount Sinai, seven weeks or 50 days after Firstfruits. This pointed to the Promise of the Father, the Holy Spirit, Whom was given to write the law on the hearts of the believers (Exodus 19:10-13; Leviticus 23:15-22; Deuteronomy 16:9-12; Acts 1:4; Acts 2:1-4; Acts 2:33; Acts 24:49). What events can we expect during the end times? The Feast of Trumpets points to the rapture and resurrection of the Church, and begins a seven-year period on tribulation earth when the world will turn on Israel in an effort to kill all of the Jewish people. The resurrected Church will stand before the Lord at the Judgement Seat of Christ to receive rewards for their works that were done as believers out of a love for God and love for their neighbor (1 Corinthians 3:11-15; Philippians 2:1-17). The Church will also attend a marriage supper of the Lamb before returning with Christ at His second coming to rescue Israel at the Battle of Armageddon (Revelation 16:15-16). At the end of the tribulation period a remnant of Israel will recognize Christ as their Messiah, confess their sin, and cry out to Him to rescue them from their enemies whom are about to destroy them. This Day of Atonement points to Christ, along with the Church at His second coming, rescuing the remnant of Israel. The Feast of Tabernacles points to Christ establishing His kingdom on earth (Isaiah 11:6; Revelation 6:9; Revelation 20:4). All believers, as part of the Church, live with Christ for 1000 years. At the end of the 1000-year reign of Christ, a second resurrection of the unsaved dead occurs (John 5:28-29; Revelation 20:5-6). At the end of the 1000-year reign of Christ, Satan is also released from the bottomless pit. He, deceives the nations into sending out an unholy army to surround the believers to destroy them at a final battle of Gog and Magog. However, God sends down fire from the sky to devour them (Revelation 20:7-10). The devil is cast into the Lake of Fire where the beast and false prophet are to be tormented forever (Revelation 20:11). The resurrected unsaved stand before God at the Great White Throne Judgement and the books documenting their lives are opened along with the Book of Life. Their sins are identified; they try to plead their case and they are judged as worthy of death. Then the Book of Life is examined for names that would have been given to them the moment of salvation. Since they are not saved, their names are not found in the Book of Life. Therefore, their documented works as unbelievers are used to determine the severity of their eternal punishment (Isaiah 51:6; Matthew 7:15-23; Matthew 10:14-14; Matthew 11:16-24; Luke 19-31; Revelation 14:9-12; Revelation 20:12-13). Death and Hell are cast into the Lake of Fire, which creates the second death (Revelation 20:14). Those whose names were not found in the Book of Life are cast into the Lake of Fire (Revelation 20:15; Revelation 21:8). A new heaven and a new earth are established where believers will live for eternity with the Lord (Revelation 21-22). We cannot know the dates that these events will occur, but we can know by looking at the signs that they are near (Genesis 1:14; Matthew 24:32-51; Mark 13:28-37; Luke 21:7-28). Therefore, we must share the gospel of Christ as a life preserver to as many people as we can while there is still time. From the beginning of the Bible until the end there are references to events that will happen in the future. However, there is a lot of confusion about what happens in the end times. Where many people get confused is that some of these events are specific to Israel and some are specific to the Church. We can know by looking at the signs that they are near, which makes sharing the gospel of Christ as a life preserver to as many people as we can while there is still time so vitally important now more than ever. May God bless us in our endeavors for Him. Previous post: Is There Absolute Truth? Next post: Is Modern Psychology Contrary To Biblical Counseling?